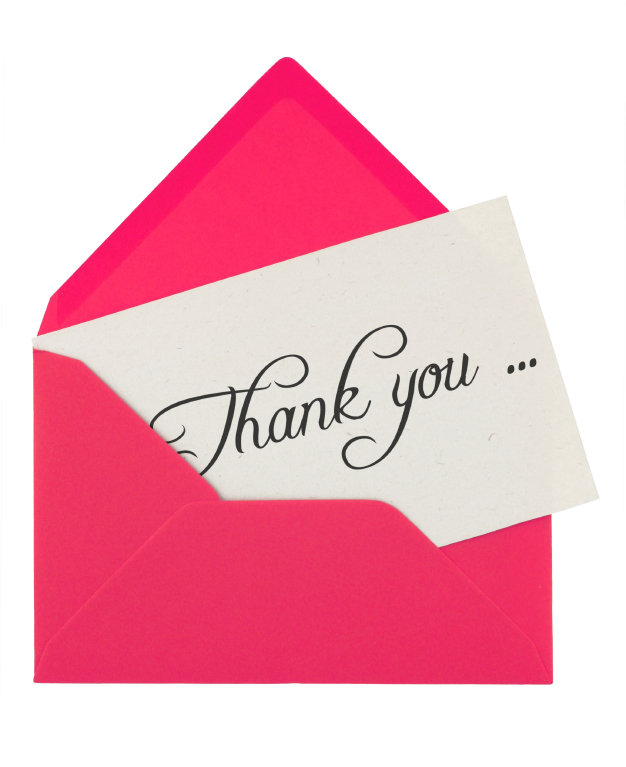 Everyone loves to feel appreciated, which is why thank you notes are still an important way to express your gratitude. Whether you're sending a thank you for a generous wedding gift or showing your enthusiasm after a job interview, a carefully crafted thank you note is an excellent way to express to the recipient that you recognize the effort they made on your behalf. Express your gratitude and name the gift or action you're writing the thank you note for. Write a sentence or two about how you benefited from the recipient's gift or actions. Conclude by mentioning the next time you hope to speak to or visit with the recipient. While not required, a well-chosen quote could also add a touching note to your writing and personalize your card or letter even more. YourDictionary has a host of quotes for you to choose from. Handwritten thank you notes are ideal, but it's now considered acceptable to send an email thank you note for a time sensitive occasion. For example, you would want to send an email thank you after a job interview to make sure your note was received before the final hiring decision was made. There are many thoughtful words and sentiments that you can use to show your gratitude in thank you notes. We have selected a few key phrases that will help you get started with writing a touching, appreciative note. We are forever grateful that you were able to share our wedding with us and we are so touched by your generous gift. We are so pleased you could join us for Liam's first birthday. He loves his first train set so much. I'm going to send you a cute picture of him playing with it. Thank you for celebrating our retirement with us. We can't wait to get out on the golf course more with you. Happy Holidays! Thanks so much for taking the time to attend our family's Christmas party, we know it's a hectic time of year. You've been there for me in some tough times and I'm so happy you were there to see me graduate. You shouldn't have gotten me a gift but it was so nice that you did and I'll really treasure it. I'm still smiling! I hope you know that Mark and I will never forget the great experience we had celebrating our anniversary with you. We're overjoyed you made it to our event. It was wonderful to see you after so long and we really appreciate you coming from so far away to be there with us. Thank you again for inviting us into your lovely home. Your hospitality was much appreciated as we're settling into the neighborhood. Sometimes the simplest things mean the most. That wonderful dinner and a comfy bed was very much appreciated after a stressful week. Thanks so much for the great time the other night. We loved seeing your beautiful new home and sampling your mother's famous lasagna. It was such a blessing to be invited to your Thanksgiving Day feast. Thank you for the delicious meal and warm welcome. Thank you for taking me in and feeding me after my surgery. It was such a blessing to not have to worry about cooking and cleaning during my recovery. You saved the day! All I can say is wow! Brunch was absolutely delicious. I only wish I had your talents in the kitchen! The cozy blanket you crocheted made my day. I'll be thinking of you every time I'm curled up on the couch watching Netflix. I am so grateful for the lovely floral arrangement you sent after my surgery. Daisies are my favorite flower and the vase is the perfect color to match my freshly painted kitchen. Every time I walk past the breathtaking landscape picture in the hallway, it brings back happy memories of our trip. I will treasure it forever. Thank you! Thank you ever so much for the sweet present. A box of gourmet chocolates was just what I needed to put a smile on my face. We love the beautiful gift you got for us. The serving bowls will be put to good use at our Fourth of July BBQ. I'm looking forward to seeing you there. We love our beautiful new lamp and we cannot thank you enough for your thoughtfulness. It's just what we needed for the den. Thank you for such a special present. The Secret Garden has been my favorite book since I was a little girl and I'm touched that you were thinking of me. You know me so well! I didn't expect to find a huge plant on my doorstep when I got home today! Thank you so much, it's the perfect addition to the patio. I am so thankful for the time you took to help with my presentation. You're a wonderful friend and coworker. Thanks so much for taking the time to help with Dalton's science fair project. We're so grateful to have a dinosaur expert in the family. We really appreciate all you have done to help us get set up in our new apartment. Look for your housewarming party invitation once we are unpacked! It was so nice of you to help me out the other day when I couldn't pick up the twins from daycare. We're lucky to have you in our lives. We are forever in your debt for helping us through this tough time. I'm humbled and grateful for your support. I will always remember how you helped me to get this wonderful opportunity. I can only hope that someday I'll be in a position to repay you. Thank you so much for all you have done to help us clean up after our basement flooded. Neighbors like you are a real treasure! You've bent over backwards for me once again. I couldn't ask for a better friend! Our conversation yesterday confirmed my interest in becoming part of your staff. I'm particularly excited by the prospect of being able to develop my own departmental newsletter. Please feel free to contact me if I can provide you with any additional information. Thank you for speaking with me yesterday about the account management position at XYZ Incorporated. I'm confident my education and past experience would allow me to meet your needs effectively. I'm very interested in the opportunity and look forward to hearing from you. I can't stop thinking about the creative approach to project management that you described in our meeting yesterday. Thank you for taking the time to interview me. I may be reached at 555-555-5555 if you need any further information. Thank you for introducing me to Daniel Masterson at XYZ Incorporated. I'm very grateful for the connection and humbled by your support of my job search. Your introduction to Daniel Masterson at XYZ Incorporated is much appreciated. Our informational meeting went very well and I'm excited about the employment opportunities they have available. My interview for the bookkeeping position at XYZ Incorporated went very well. Thanks so much for agreeing to serve as a reference on my behalf. I'm pleased to report that I've accepted an internship with XYZ Incorporated. Thanks again for answering my questions about the field of cloud computing and agreeing to serve as a professional reference. Use these ideas as a guide to help you create a heartfelt thank you note. Now that you have seen these examples of great ways to start off a thank you note, you are ready to write your own notes after you receive a nice gift, attend a dinner party or interview, or someone helps you. Remember to make the thank you note personal and be sure to mention specifically what you are thanking the recipient for. "Examples of Words for Thank You Notes." YourDictionary, n.d. Web. 18 April 2019. <https://examples.yourdictionary.com/examples-of-words-for-thank-you-notes.html>.